If you are more passionate about screen printing as an art than a business, screen printing software won’t be the first thing you think about when setting up a commercial screen printing studio. Many creative entrepreneurs like that screen printing is still very much a craft. There’s nothing push-button automatic about it. You can work with your hands, get a little messy, and create highly original works — even within the limitations of the screen-printing process. Even better, your work won’t look slick and mass produced. Not all prints will look identical or perfect. 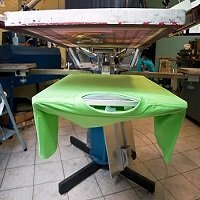 Screen printing is popular for printing promotional posters, T-shirts, and merchandise for musicians, artists, and designers who appreciate the uniqueness of each print. To build a career around your love of screen printing, there are ways to make the business side less stressful. First, think through some basic questions. What types of clients will you print for? What types of products will you offer? Who will create the designs? What other types of printed products do your target customers order? How can you guarantee a relatively steady flow of income throughout the year? Brainstorm ideas with partners and collaborators. But after clarifying your vision, make sure everyone in the shop understands your goals. The first types of screen printing software you will need includes design software (such as CorelDraw), templates and clip art, and software for making color separations or outputting film separations on an inkjet printer. You can purchase these design and prepress tools through your favorite screen-printing supply store. As your business starts attracting more customers, you will want screen printing software that can manage the many details involved with providing multiple estimates, entering orders, coordinating approvals, and delivering finished jobs. With print shop management software for screen printers, you can spend more time on your craft and less time answering routine questions about prices or the status of work in progress. All of this information will be easy to retrieve through the software. Some software, such as Ordant, enables you to quickly see previous jobs you have completed for each customer and keep track their preferences and special instructions.. If your growing business continues to use paper-based systems for estimating jobs and managing orders, there will eventually come a time when some important job details get lost in the shuffle. Your customers won’t be impressed. The best strategy is to stay organized in the early stages of your business, and plan to add print-shop management software when you reach a certain volume of monthly orders or revenue. Your screen-printing supply company won’t be the best place to shop for print business management software. That’s because a screen-printing supply store may only carry products related to screen-printing equipment. As a creative entrepreneur who serves other creative professionals, you may want to take your screen-printing business in some unexpected directions over the new few years. For example, maybe you would like to help some of your favorite designers, bands, and artists set up online stores through which they can sell screen-printed merchandise.Or maybe you would like to sell your own branded designs online. With the optional web-to-print module in Ordant, you can set up portals for easy online ordering. The job and customer data from each order will flow directly into Ordant’s order management and job tracking system. You don’t have to worry that an incoming order will fall through the cracks. At some point, you may want to add digital printing equipment that can output complementary products such as business cards, postcards, decals, banners, and backdrops.. For these types of jobs, you will need print-shop software that is more versatile than software designed exclusively for screen printing. The best way to buy print shop management software is to do an online search for programs that can support screen printing, large-format graphics, and other types of printing. Then schedule a demonstration of programs look like they could make running your business infinitely easier. Of course, we encourage you to check out Ordant. You don’t have to be an accounting whiz to use it and the software can easily be adapted for a mix of screen-printing presses, large-format printers, digital presses, or label printers. Everyone in your shop will be able to use it too, so they won’t have to interrupt you with basic questions about pricing or job status. To see why Ordant is the best screen printing business software for creative entrepreneurs who love the artistic side of screen printing, visit https://www.ordant.com/screen-print-estimating and schedule a demo.